“I would modify the translation of the last part of v. 17 ‘the just shall live by faith’ because it does not quite capture how Paul in the Greek slightly tweaks the Hebrew of Habakkuk 2:4. Paul is not highlighting the means whereby the just live. But here he hints and later in the epistle he is arguing about 2 ways of seeking to be just before God (see especially Rom. 10:4-6). Seek God’s justice by faith (Greek: ek pisteōs), and be declared just by God or seek God’s justice by works of [the] law (Greek: ek [tou] nomou) and “yu salt” [= your effort is futile]. Paul’s epistle to the Galatians argues as well about these 2 ways of seeking to be just before God. See especially what is regarded as the thesis statement of this epistle 2:16 (Greek: ex ergōn nomou, by works of law vs. dia pisteōs, through faith). So then, might the scriptural heart of Luther’s reformation be a (slight?) 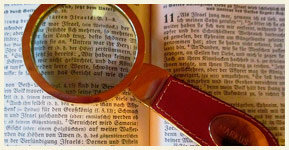 misreading of scripture? Just asking, ok mischievously, since I am no historian.